An award winning play by Jane Coyle is coming to the Riverside Theatre on February 7th as part of this year’s Holocaust Memorial Day commemorations. The Suitcase, set between 1930s Vienna and modern day Belfast, tells the fictional story of Leo and Galina. The tale of two young people, caught up in the dark events of 1930s Europe, illustrates the way in which the Holocaust was made up of millions of small, individual tragedies. The production in Coleraine is supported by Causeway Coast and Glens Borough Council’s Good Relations programme, with a number of subsidised tickets now available for school groups, community groups and students priced at £5 per person. 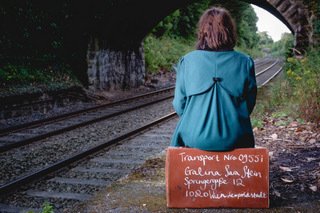 The Suitcase premiered in the Belfast synagogue during the 2015 Belfast International Arts Festival and won the Belfast Telegraph Audience Award. With a specially composed, atmospheric soundscape, it is a love story, a hymn to the restorative power of art and a life-affirming human drama. The performance in Coleraine will be followed by a facilitated audience discussion focusing on issues raised by the play. Bookings for the Riverside performance of The Suitcase can be made online at www.ulster.ac.uk/riverside/whats-on or by contacting the Box Office on Wednesdays, Thursdays and Fridays from 11am – 2pm (Tel 7012 3123). There is limited availability for subsidised £5 tickets. To book please email r.daley@ulster.ac.uk. Please note proof of valid student ID may be required. The production is supported by The National Lottery through the Arts Council of Northern Ireland; the Community Relations Council; the Executive Office through District Councils’ Good Relations programme, Ards & North Down District Council, Causeway Coast & Glens Borough Council, Mid Ulster District Council and Newry, Mourne & Down District Council.